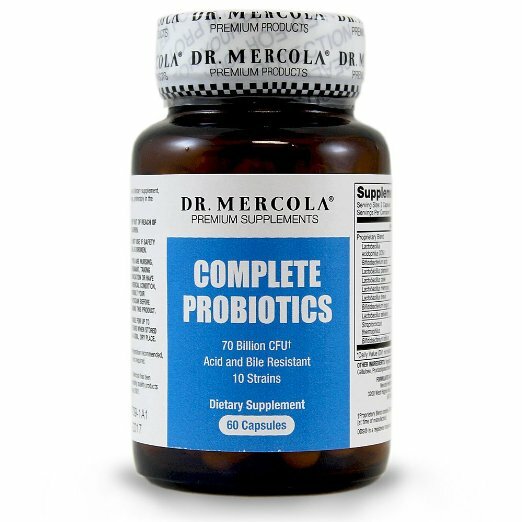 Mercola Complete Probiotics is a probiotic supplement containing 10 strains of acid- and bile-resistant lactic acid bacteria, including L. acidophilus DDS-1 and L. brevis. It is one of the few probiotic supplements containing Lactobacillus brevis. Although Dr. Mercola devotes a page on his website about what probiotics can do, and in particular what DDS-1 can do, the product itself makes no marketing claims. What Probiotic Strains are in Mercola Complete Probiotics? What are the Other Ingredients in Mercola Complete Probiotics? The other ingredients at the time of this writing are vegetable cellulose, microcrystalline cellulose, fructooligosaccharide (FOS) as 5% of the capsule ingredients and silicon dioxide. What is the Recommended Dosage of Mercola Complete Probiotics? The recommended serving size for adults is 2 capsules per day, preferably in the morning. Dr. Mercola says he takes it on an empty stomach 30 minutes before he eats. I have a different opinion about that because while capsules may move faster through an empty stomach, the morning pH of your stomach acid can be very low which can kill microbes if they stay in there too long or which can make you feel nauseous. It also states that if you experience GI upset while traveling from different foods (or water), you can take additional servings (recommended 4-6 probiotic capsules) to help give your digestive system the additional support. Who Manufactures Mercola Complete Probiotics? “First to introduce Lactobacillus acidophilus DDS-1 commercially." "First to introduce quality control standard CFU/gm, now used worldwide." "First to introduce non-dairy and gluten-free probiotics." "First to introduce nitrogen packaging to enhance stability." "First to introduce acid- and bile-resistant probiotics." "First to introduce the combination of probiotics with prebiotics." The company that fits these clues is UAS Laboratories, makers of the UP4 line of probiotic supplements. What are the Pros of Mercola Complete Probiotics? Contains L. acidophilus DDS-1 and L. brevis which, if you desire the characteristics of these beneficial bacteria, are rarely found in other supplements together. Strains were demonstrated by the manufacturer to have very good to excellent acid and bile tolerance, meaning that they should arrive in your intestines alive. Shelf-stable. Refrigeration is recommended but not required. Stable for up to 2 years when stored in a cool, dry place ad guaranteed to have the 35 billion CFU per capsule at the time of expiration. What Are the Cons of Mercola Complete Probiotics? Only the species are given for all but the DDS-1; you don't know which strains are in the product since the information is proprietary. This supplement contains FOS, a prebiotic fiber to support the growth of the microbes, which may pose problems for some people even though it is in an insignificant amount of 5% of the capsule ingredients. As with most probiotic supplements, this one should be refrigerated after it is delivered, but this one is able to be unrefrigerated for traveling. No studies with this supplement as a whole supplement have been performed to my knowledge, but this is not unusual. Very few multi-species probiotic supplements are used in studies. Instead, species and strains that are show to be effective are combined in most multi-species supplements such as this one. Whether or not the strains compete with each other in a laboratory setting is not known since we don’t know which strains are in it. Compared to other multi-species probiotic supplements, this one contains a high number of total CFU of 35-45 billion per capsule, but with 10 different strains, some of those strains may have negligible amounts. There is no way to know. This product is sold in bottles of 60 or 180 capsules and you can save more by buying the larger amount. Is Mercola Complete Probiotics the Right Supplement for YOU? If you would like help in determining if this probiotic supplement is right for you, please consider nutritional consultations with me. This is a high potency supplement, has "safe" species of Lactobacillus, Bifidobacterium and Streptococcus thermophilus, has L. acidophilus DDS-1 and L. brevis, is free of most allergens and is packaged securely. I must admit that I have a lot of respect for Dr. Mercola and his passion for health-related issues and although I wish more information on this supplement was disclosed, I still think it is a quality supplement. Thanks to Caterina for suggesting a review of this supplement!